Rene Testa had always wanted to work with babies. She started baby-sitting in standard 2 and always had a baby in her arms. She graduated from university in 1977 and worked in administrative roles before becoming a stay at home mom raising her own 3 children with dedication and passion. When her children were older she became involved in work, ministry and learning activities including studying, becoming a minister, counselling and real estate. She later started her own importing company, but the work was frustrating and getting nowhere and Rene felt it was not what she should be doing with her life. She contemplated the meaning of her life and what she wanted to do. She believed God was telling her to get started on what He had called her for. She did not want to look back and find that she had wasted her time. She knew that she had so much to give and that time was running out. The time to do it was now and she just had to go for it and trust God. She had always believed that she would work with babies, but had initially thought she would look after babies whose mothers had to work and did not have the time to stimulate them. These thoughts changed when her daughter, who had been au pairing overseas, came back to South Africa and the two decided to take in abandoned babies who needed a home. After spending time with God, pondering, contemplating and dreaming, Rene knew she had to take the leap and just do it. So in November 2009 she opened her home, and together with her daughter Monique, started caring for abandoned babies. She called her home Barnswallows. Barnswallows provides a place of safety for abandoned, abused or neglected babies until they are adopted, reunited with parents or on a long term basis. 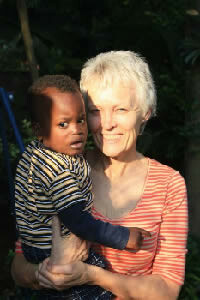 Barnswallows specialises in special needs babies, especially those with Foetal Alcohol Syndrome and even brain damage. Rene and one other fulltime caregiver work together with a team of 5 volunteer experts and specialists such as chiropractors, and massage therapists to help these little babies overcome their developmental delays. “We focus on stimulating the babies in order to get them to become civilized and contributing members of society attached to their one main caregiver,” explains Rene. “We are excited about being able to introduce our babies to a new Auditory Integrated Training Programme for sensory integration to help them learn to speak sooner and to help with the spectrum of brain disorders most of the suffer from.”Barnswallows currently has 3 babies and can take up to 6 babies at a time, but 17 babies have come through the home since it started 2 years ago. In addition, Barnswallows has started an on-site Vegetarian Cooking School to provide information on green living to the public and help feed the elderly as well as provide excellent nutrition and the specific diets needed by the special needs babies she looked after.Barnswallows also works at the West Rand Christian Centre in a poor area of Claremont where they give any excess clothes and goods to the 35 preschool and 120 school going children in the area. Barnswallows also helps provide bread to 130 children in the Newlands area. “Up until now we have been mostly self-funded with a few small donations from friends and family and have no big business supporting us. Barnswallows is a community project and we need the financial and moral support of the community in order to continue our work. We are always looking for second hand clothes, toys and equipment that is still in good condition that we can use, and the financial support of ordinary citizens enables us to continue what we do for these little ones,” says Rene. Commenting on the main challenges she has faced during this 2 year journey, Rene says that negativity from close friends about what she has taken on has been a challenge she has had to overcome. A lack of finances has also made her work more difficult.“Over the two years it has been very hard work but very rewarding to see the change in the lives of these babies and to see them learn to walk and talk and overcome their developmental problems is a miracle.My life has changed completely. I just continue to keep the dream in my heart alive and ignore the negative comments of others and to pursue my passion and what I believe God has placed in my heart. I have had to learn to really trust God for everything,” says Rene. Looking to the future, Rene would like to expand and move Barnswallows from her home onto a larger property and closer to poorer areas. She is also planning to start another Barnswallows home in Darling on the West Coast of South Africa where the levels of Foetal Alcohol Syndrome are the highest in the world. There is currently a home in Darling for abandoned children of 6 and older, so Barnswallows would help the young babies in that region. “If every Christian could think of adopting an orphan instead of having another child of their own, we would be able to transform society in one generation as these children would take on our moral values. We could provide them with a good foundation in life and break the cycle of abuse that would otherwise just continue. We at Barnswallows believe that we can change society one baby at a time and we need the help of the community to build this project,” concludes Rene.